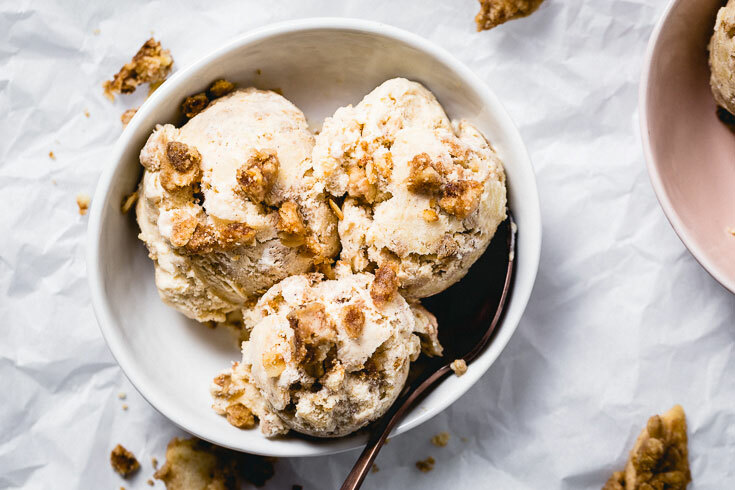 A decadent creamy vanilla bean and cinnamon ice cream infused with delicious apple crisp is the best of both worlds. Apple crisp topped with vanilla ice cream is one of the great pleasures in life. I can still remember making apple pies as a kid. The smell that fills the house is unforgettable. I’ve since migrated to making apple crisps instead of pies because it is just so much easier to make the crumble topping. 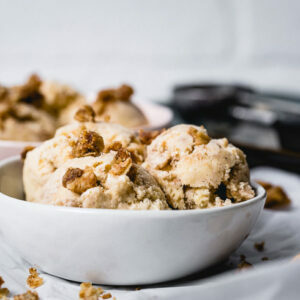 I started wondering the other day what would happen if the apple crisp and the vanilla ice cream were combined to create apple crisp ice cream. If that sounds like it would be pretty wonderful to you; then you are in luck, because it turns out to be so amazing. The ice cream is a vanilla bean and cinnamon base, which goes perfectly with the apple crisp. First, make the ice cream base with the milk, cream, sugar, salt, cinnamon and vanilla bean. When the sugar is dissolved, the base will steep for 30-minutes to infuse the vanilla bean and cinnamon flavors. The egg yolks are then tempered with the hot milk mixture and the base is chilled completely before spinning in the ice cream machine. 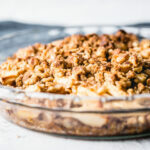 You can really use any apple crisp, but I happen to already have an awesome Easier than Pie Apple Crisp recipe ready for you. 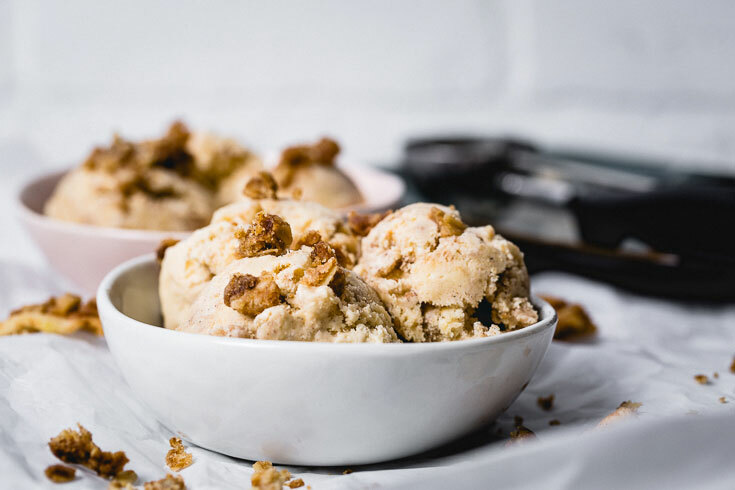 You will definitely want the apple crisp to be completely cooled before adding it to the ice cream, but you already knew that. Chop 2 1/2 cups (about 2/3 of a pie pan) of apple crisp into small pieces on a cutting board. Make sure no large pieces of apple remain, or they will become icy when frozen. Once the ice cream is finished spinning (mine takes about 10 minutes), mix in the chopped apple crisp. Freeze overnight and it’s ready to enjoy. With this ice cream, it’s pretty important to let it sit on the counter for about 5 to 10 minutes before eating it. This is to let the small apple pieces warm up slightly and not be icy. This list contains affiliate links where I might receive a commission if you make a purchase, at no additional cost to you. 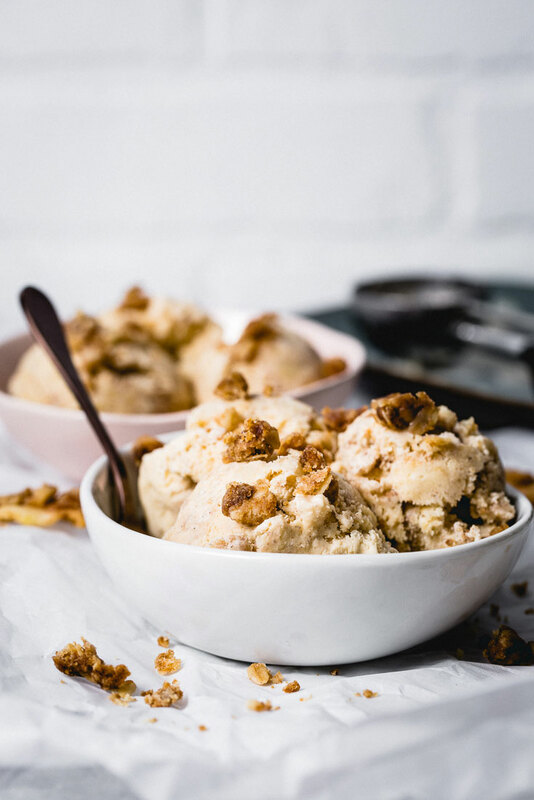 A decadent creamy vanilla bean and cinnamon ice cream infused with delicious apple crisp is the of the best of both worlds. Split the vanilla bean in half lengthwise with a sharp paring knife and scrape the seeds into a medium saucepan with the cream, milk, sugar, cinnamon and salt over medium heat; whisk to dissolve the sugar (about 4 to 5 minutes). Remove from the heat and set aside to steep for 30 minutes to infuse the vanilla and cinnamon. Bring the milk mixture back up to temperature. Gradually pour about 1 cup of the hot milk mixture into the egg yolk bowl, while continually whisking to temper the eggs. Add the tempered egg yolk mixture back to the pan while whisking until it just comes to a simmer. Remove the pan from the heat, then add the vanilla extract. Pour the ice cream base through a fine mesh strainer and chill completely either over an ice bath or in the refrigerator. Spin the ice cream base in a maker according to the manufacturer's instructions. While the ice cream spins, place 2 1/2 cups apple crisp on a cutting board and chop it into small pieces. Make sure there are no large pieces of apple left or they will become icy when frozen. 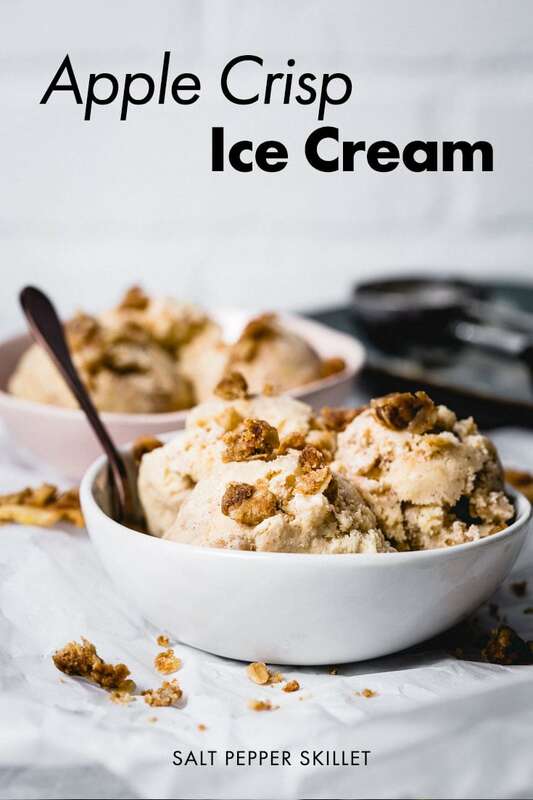 When the ice cream is finished spinning, Continue this process until all of the ice cream is in the container, then freeze for at least 5 hours, or overnight before serving. Let the ice cream sit out for 5 to 10 minutes before serving to allow the apple pieces to warm up for the best texture. 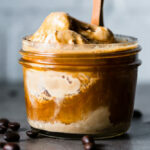 The most refreshing and satisfying sweet Italian coffee treats for a hot summer day. 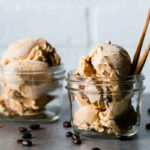 This most delicious rich and silky espresso ice cream with a little caffeine boost.